What are some of the prophetic implications of world missions? Dr. Reagan: Let's take a quick look at some of the prophetic implications of world missions. Matthew 24:14 says, "that the Gospel will be preached to the whole world and then the end will come." 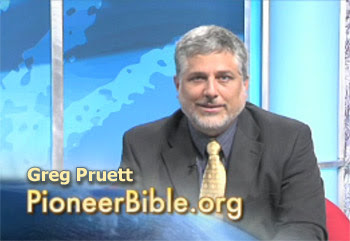 As we have seen in this discussion with Greg Pruett, Bible prophecy is being fulfilled right before our very eyes today through the utilization of modern technology. Communication's tools like short-wave radio, and movies, satellite television, the Internet have furthered and the translation of the Bible into many languages. But, there is one point I want to make crystal clear, and that is the preaching of the Gospel to all the world is not a condition for the Rapture of the Church. The Bible teaches that the Rapture is an imminent event that could occur at any moment. There are no signs of the Rapture. The signs of the times relate to the Tribulation and the Second Coming. But, when we see these signs accumulating as they are today, you can be assured that the Rapture is right around the corner and that we are living on borrowed time. One other point, although we are making great progress today in proclaiming the Gospel to all the world, the prophecy in Matthew 24:14 will not be completely fulfilled until near the end of the Great Tribulation. At that time, right before the final pouring out of God's wrath in what the Bible calls the Bowl Judgments, we are told in Revelation 14:6 that God in His infinite mercy will send forth an angel to proclaim the Gospel to every person on planet earth, giving mankind one last opportunity to repent. The message proclaimed to the whole world by that Gospel angel will constitute the final fulfillment of the prophecy in Matthew 24:14, and then the end of this present age will come with the Second Coming of Jesus Christ. Now, folks, that will not be the end of the world, only the end of this present age, for when Jesus returns He will set up His Millennial reign whereby He will rule over all the world from Mount Zion in Jerusalem for a thousand years. Then the world will be flooded with peace, righteousness, and justice. In summary, the return of our Lord is going to occur in two stages. First will be the Rapture of the Church, which is an event that could occur at any moment. Second, the Second Coming will occur at the end of the Tribulation after the Gospel has been proclaimed to every person on earth. Are you ready for the Rapture? If Jesus were to appear in the Heavens today, would you be called to Him, or would you be left behind to face the terrors of the Antichrist during the Great Tribulation? If you are not ready I pray you will reach out to God in prayer, confess you are a sinner, repent of those sins, and receive Jesus as your Lord and Savior. Don't put it off. Do it now! Do it now because your life will be transformed, for you will receive the gift of the indwelling of God's Holy Spirit who will serve as your Guide and Comforter, and He will give you the strength to cope with the evil of this world. Look up, be watchful, for our redemption is drawing near! Psalm 83 on the horizon...likely the catalyst for a Gog/Magog response! JESUS IS COMING ANY TIME NOW! ANY TIME! Hizbullah has canceled leaves and is preparing for war, according to the Kuwaiti newspaper As-Seyassah. “Hizbullah cancelled the vacations of all its militants, summoned thousands of its members and gave orders to its prominent officials to remain unseen in case a war broke out,” the daily said. It added that the terrorist army and political party put its combat units, including missile units, on extreme alert. The newspaper also reported that the IDF is aware of Hizbullah’s preparations and has increased reconnaissance flights over southern Lebanon. Hizbullah’s general mobilization also includes orders for senior officials to find a place to hide in the event that war breaks out. Although similar alerts occur often, sources told that the new preparations follow a televised speech, via a video link, by Hizbullah leader Hassan Nasrallah on Friday. He warned that a war against Iran and Syria would spread to the entire Middle East, but he added that an Israeli attack on Lebanon is unlikely in the near future. The reports of a possible Israeli attack on Iran’s nuclear facilities may be behind Hizbullah’ alert. The current routine but large-scale military training in the Golan Heights may also be a cause. It includes preparing ground troops for urban warfare. "On a tactical level we'll see an attempt to wear us down with urban warfare, which is characteristic of the fronts we face today. There will be a close battle between ground forces,” IDF ground forces commander Maj. Gen. Sami Turjeman told UPI. Nasrallah last month threatened that Hizbullah missiles would strike metropolitan Tel Aviv in the next war, if and when it comes. He also said that ground forces would force their way into northern Israel for the first time since the War of Independence in 1948. "The next war will be completely different," former Northern Command Maj. Gen. Gadi Eizenkot, told UPI. "Hizbullah will be better prepared. So will we." With the recent news of Russian warships approaching Syrian territorial waters, it appears we might want to upgrade the war scenario a little bit Billy! Not a Psalm 83 conflict yet more like an Ezekiel 38-39 conflict. I have expected Russian intervention on behalf of both Syria and Iran. "Be thou prepared, and prepare for thyself, thou, and all thy company that are assembled unto thee, and be thou a guard unto them"-Ezekiel 38:7. It is clear that Russia will not allow Syrian or Iranian territory to come under any military assault like that used to topple Libyan strongman Muammar Gaddafi. Though the U.S. and N.A.T.O. have been inspired by their successful alliance with Al Qaeda and the Muslim Brotherhood both in the Egyptian and Libyan operation, it is clear however that their momentum is soon to come to an abrupt halt. Russia as well as China have heavy investments in Iran and Syria in the form of petroleum, natural gas, and weapons trade. In a short space of time, I believe the Gog/Magog participants will begin to gather along the borders of Israel for various reasons, though they may be at odds with each other at the time, clearly an evil thought or proposal will unite them for one purpose. Though some may despise each other and hold deep resentment and hatred, they will direct this to another source, the Jewish State of Israel. An impotent an cowardly response from the West will of course not persuade them from their goal. Thankfully, we all ready know how it all turns out! To God be the glory, forever and ever!! !